The bulk of the population, however, was employed on the land or in Egyptian agriculture-related industries like viticulture, papyrus-manufacture, spinning and weaving. The agricultural cycle comprised three seasons. The Akhet, the season of the inundation, which began on 19 July, the Perit (‘going out’), the season for ploughing and sowing which began on 15 November, and Shemu, the harvest, which began on 16 March. 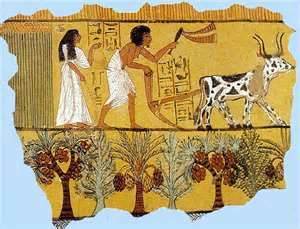 With the rise of the Nile the peasants made sure that their cattle were safely housed on dry land and, with agricultural activities suspended, cared for them and provided them with food already laid in storage. They carefully directed the water from the main canals to smaller branches transversing the fields in straight or curved lines, and controlled it by means of embankments. When the water level began to fall these natural reservoirs retained a residue of mineral-rich sediment which was ready to receive seed without further preparation. Thrown on the surface the seed was usually trodden by goats. Where, however, the earth dried hard, a plough was used. The hoe, one of the most ancient of agricultural tools consisted of a broad, pointed blade of wood attached to a handle at an acute angle and held in position in the centre by a slack rope. The plough was a hoe enlarged by adding two long wooden arms on which the ploughman could lean to keep the furrow straight and also to pressure the blade into the soil. A pole was provided with a yoke for attaching to draught Egyptian animals. Although the Nile valley and the Delta were fertile, full exploitation of the land only came with unremitting toil. Naturally the peasants, from centuries of experience, had gradually become aware of the potential. They had determined the most suitable times for sowing and reaping, and the most rewarding systems of irrigation for the different areas. 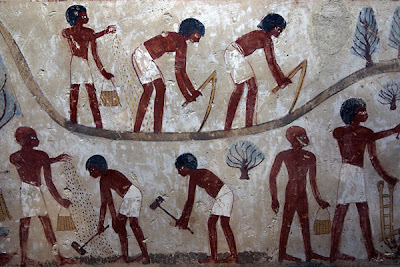 In the Egyptian temple of the 5th-dynasty pharaoh Nyuserre the life of the peasant is depicted during the seasonal operations throughout the course of a single year. From these and from scenes in the tombs of noblemen it is clear that the harvest was the season of most strenuous activity. The ripened corn was reaped with the aid of a sickle, placed in sacks and loaded on to donkeys to be carried to the threshing floor. The ears of corn were then taken from the sacks and piled in heaps to be trodden by oxen, goats or donkeys. The threshed grain was piled in a heap by means of three-pronged forks and sifted and winnowed by two small boards or scoops. The latter were used in pairs for tossing the unhusked grain into the wind. Finally the grain was placed in sacks by women and transported to the granary. Flour was ground by placing grain at the upper end of a slightly hollowed, slanting slab of limestone and sliding a crossbar of sandstone across it. The ground flour gradually worked downwards and was caught in a tray at the lower end. Flax was also cultivated in large quantities. It was harvested at different times for different purposes: when ripe, the fibres tough, it was suitable for mats and ropes. If cut when the stems were green, it could be woven into fine soft cloth: some of the surviving remnants show that the fabric was sometimes of such gossamer fineness as to be almost indistinguishable from silk. This was particularly the case with royal linen, though coarser textiles were woven on a more widespread scale. Weaving was carried out by women, who also made tapestries. The latter were either for hanging on the walls of Egyptian noblemen’s villas, or to form the shade of a roof garden. Viticulture was one of the most highly developed, as well as one of the earliest, industries. The first wine-press hieroglyphic dates from the Egyptian 1st dynasty, and there is evidence that even from this early date wine was transported across the country in sealed jars. Grapes were plucked by hand, placed in vats and trodden until the liquid ran through holes into a waiting container. Fermentation probably occurred naturally, due both to the method of pressing and the high summer temperature. Date-palm wine was also produced. The manufacture of papyrus paper was another flourishing industry. The papyrus, sliced into thin sections, was laid side by side and crosswise, soaked and compressed. Beating and drying turned it into sheets of durable paper. Two rolls of papyrus in a box dating to the reign of the Egyptian 1st dynasty pharaoh Udimu are evidence of how early it was produced. Ships trading with the Phoenician coast carried bales of this essentially Egyptian product as cargo. The papyrus plant served many purposes: the stalks were woven and used as mats, the vegetable fibres were transformed into a pliable, tough material suitable for sandals, and lightweight skiffs for hunting in the marshes were made by binding long bundles together. Veterinary medicine was practised by the peasants and the obvious health of the herds indicates proficient rearing. It was a talent handed from father to son. In the Egyptian tomb of Ptahhotep a scene shows a cow giving birth with the aid of a veterinary surgeon who gently guides the calf into the world. The ancient Egyptians knew their animals intimately, took great Egyptians care of them and often fed them by hand. In the tomb of Ti a cow is being milked by a cowherd while the overseer leans on his staff watching. Though there are scenes of herdsmen driving rams across a canal with raised whip, none shows an animal being beaten.